Algunas veces la vida te da sorpresas muy especiales. Hace algunos días tuve la fortuna de conocer a Javi Fornos un Crack del Metal en España. Después de un par de días terminamos hablando de una Mujer impresionante por su manera de percibir lo que encierra el Mundo del Metal. Ella es Verónica Gutiérrez ( Schenker) Una mujer que en su momento crei que hablábamos de eso una Mujer pero conforme la conversación tomaba matiz, me di cuenta que hablábamos de una Chica de tan solo 13 años que percibe y transmite de una manera impresionante. Porque cuando algo te gusta, no hay manera que algo o alguien te detenga. No importa tu edad, cuando le agarras gusto a algo de verdad, lo vas a tener toda tu vida. Javi Fornos esta completamente seguro que Verónica a su corta edad tiene mucho que mostrar al Mundo . Su capacidad para escribir no tiene limites , porque sin duda alguna ella habla con el Corazón. Verónica es una Chica que ha revolucionado los medios en España con su seguridad , creativad e inteligencia, ademas de su amor por el genero Metal, hablar de ella ahora mismo en Rockeros.net es un placer. En lo personal , me siento muy contenta de que hayan confiado en mi para dar a conocer un poco mas de ella en Nuestros Medios en Estados Unidos a donde llega nuestra señal a travez de Rockeros.net , Gracias Verónica y Javi por la confianza. 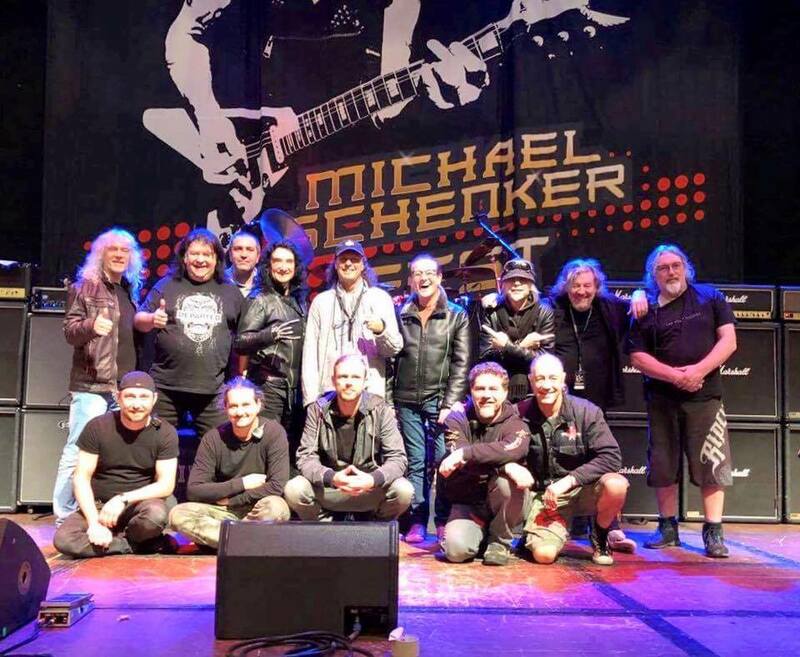 Aquí les dejamos un ejemplo de la reseña que Verónica y Javy comparten con nosotros sobre el MICHAEL SCHENKER FEST realizado en Barcelona, España la cual nunca pudo ser publicada en Ingles en España, ni fuera de Europa por el pequeño detalle de su corta edad. Esperemos que no sea la primera ni la ultima colaboración con nosotros ya sea de manera individual o al lado de Javi Fornos y que puedan seguir manteniendonos al tanto de la escena Metalera en La Madre Patria para poder compartirlos con toodos los seguidores de Rockeros.net , Bienvenidos Chicos! 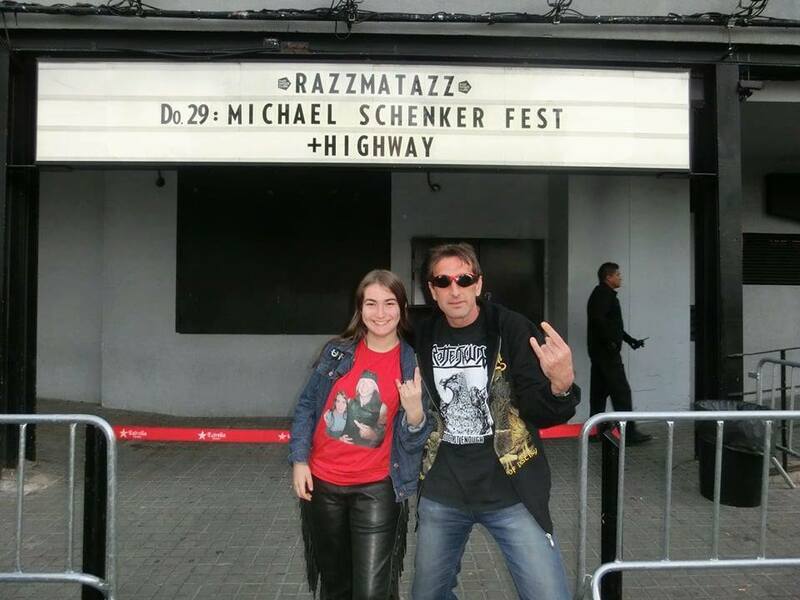 MICHAEL SCHENKER you’re on earth ... (THANK YOU). Great night to remember in the memory of all those present on Sunday, October 29. Remarkable entrance high for a concert of these characteristics, a lot of people from all the Spanish geography was presented in the Razzmatazz hall of Barcelona to see this show. The poster already said it, a (MICHAEL SCHENKER FEST). And if it was, a living legend of the guitar was presented with high caliber musicians in Barcelona, nothing more and nothing less with the vocalists GARY BARDEN, GRAHAM BONNET and ROBIN McAULEY, escorted by CHRIS GLEN on bass, TED McKENNA on the drums and STEVE MANN on the keyboards and also on guitar. They were going to play classic tracks of the legend (SCHENKER). The evening was opened by the French Hard Rock band (HIGHWAY). The influences of this band are very noticeable when you have been listening to a couple of songs. (SCORPIONS, WHITESNAKE, ZZ TOP) etc ... etc ... BENJAMIN FOLCH, BEN, ROMAIN CHAMBERT and SAM MARSHALL liked and won the public shortly after starting their show even many people singing songs of the band and supporting choirs with BENJAMIN, a big download of Hard Rock in all rules and for many of us was very short. After a few minutes of very long waiting because they were very excited about M.S.F / and if they allow me on the part of many until cravings in our ears. We continue with another song from his debut album (The Michael Schenker Group - 1980), nothing more or nothing less than one of his greatest hits, and no wonder, CRY FOR THE NATIONS !! A round of applause for STEVE MANN, has undoubtedly shown what it's worth... They’ve played this track in an incredible way, really moved the audience to the first time of MSG, the beginning of the 80's. But the show goes on, and there goes one of his best songs, without a doubt the SCHENKER song, our Mad Axeman, yes, the impressive MSG song from his second album, MSG (1981), the unbeatable... ATTACK OF THE MAD AXEMAN !!!!!! With this tune, the whole audience was moved, not only because of its quality, that certainly, but also because of the positive energy that they gave off, SCHENKER could be seen that he really loved being there and being playing that track, even they were excited and full of happiness for the moment, something indescribable with words, just live the moment and see the musicians could say what many of us felt there. And it's time for another great hit, another great MSG classic (another tune of his 1980 debut album)... We talked about a track that we all know and couldn’t miss, of course... the show had to continue, so we had to be armed and ready... it's time to ... ARMED AND READY !!!!! We wanted more, yes ... And we didn’t want GARY to leave... but MICHAEL had more, and this time he played one of his classics of his time with SCORPIONS, specifically the album Lovedrive (1979) COAST TO COAST...!! This tune was one of the successes of the night, people were vibrating, everyone jumped, no doubt that they had won the audience fast, and all the people were humming every chord of the song, and even MICHAEL could see on his face that he was also enjoying. Many wished that this track had lasted all night, but it was time of the next vocalist, nothing more and nothing less than... GRAHAM BONNET!!!! MICHAEL introduced him and then he greeted the audience and they started playing one of their classics... DESERT SONG!! (Assault Attack 1982) Every time all was getting better, and people didn’t stop enjoying, time flew... It had certainly been magical to see this track live. And we can say that it was a privilege to be able to see MICHAEL and GRAHAM live together, because GRAHAM wasn’t on the Assault Attack tour, GARY BARDEN replaced him on the tour, they didn’t play live, so that made the concert much more interesting. The people weren’t tired, and the musicians of MICHAEL SCHENKER FEST neither, they had more, and it was time to play a song of their masterful but underrated album Built To Destroy (1983) so here we go with another instrumental, and it’s called... CAPTAIN NEMO !! Oh Yeah, this can’t get better... Captain MICHAEL gave everything on stage, each note played perfect, proved to be a god of the guitar while make us cry tears of enthusiasm and excitement. But it isn’t over, MICHAEL introduced the third vocalist ... Mr. ROBIN McAULEY!! Even though the McAULEY SCHENKER GROUP era has been the most criticized, ROBIN made us take our hats off ... this part of the show begins with a song from the first album by McAULEY SCHENKER GROUP (Perfect Timing - 1987). .. NO TIME FOR LOSERS !!!!!!! Well, as the same title says, No Time For Losers (No Time To Lose) so there was nothing to talk about, people were enchanted with ROBIN, what a wonderful track... impressive !!! We continue with a song from the most successful album by McAULEY SCHENKER GROUP (Save Yourself - 1989) as we go with the title track of the album... SAVE YOURSELF !! MICHAEL starts with an introduction that leaves you open-mouthed, you get paralyzed because of the emotion and you just can hear him playing, and then CHRIS, STEVE and TED come in to reed with the rhythmic base... A track that everything you say isn’t enough, of what will never be able to compose again, with this they have already demonstrated who they are, people can’t stop applauding them! Unfortunately, the repertoire of McAULEY SCHENKER was over, but it was time for the much-anticipated track of UFO (Phenomenon - 1974), the first UFO album with MICHAEL SCHENKER... it was time for one of the songs with the best guitar solo in the universe... ROCK BOTTOM..!!!!! ROBIN sang the song, and the truth was that it can be said that ROBIN sang it perfectly, how magical is this artist! MICHAEL started his wonderful guitar solo, the audience couldn’t contain the emotion, he showed that he is the god of the guitar, without doubt!!! - Thank you very much from deep inside to the all the band, I’ll remember this show forever and ever for the rest of my life.